This page has been accessed 46,024 times. The WikiTree Category "Category: Gateway Ancestors" refers to Colonial immigrants descended from Magna Carta surety barons, as documented in Douglas Richardson's book, Magna Carta Ancestry pub. 2011. Those Gateway Ancestors are the focus of this project (see list, below). The term "gateway ancestor" is also used by genealogists to designate descendants of royalty. For purposes of this project, the term is limited to the use Douglas Richardson gives it - American colonists who arrived before 1700 and who are descended from a Magna Carta surety baron, documented in Magna Carta Ancestry - A Study in Colonial and Medieval Families by Douglas Richardson. They are also included in Douglas Richardson's 2013 Royal Ancestry: a Study in Colonial & Medieval Families, Vols. 1-5. Either of these two sets by Douglas Richardson are preferred for source documentation on Gateway Ancestors. Google Books has a free search of Magna Carta Ancestry and Mr. Marlyn Lewis' website includes some Gateway Ancestors and all of the Magna Carta barons - two free alternatives to purchasing the books. Magna Carta Team Base Camp - this is where we track completed trails and trails under construction, from Gateway Ancestors to their Magna Carta surety baron ancestors. For help developing and reviewing Magna Carta Project profiles, see Magna Carta Project Checklist and Magna Carta Project Section. The following profiles are within the scope of the Magna Carta Project. This list is derived from Richardson's Magna Carta Ancestry (2011), Vol. 1, page xxiii. Note: The list has been augmented by names included in Richardson's Royal Ancestry (2013). Married women are listed in two places : under their LNAB and also their married surname. Profiles listed below are not on Richardson's list but may have sufficient documentation to show they are linked to the Surety Barons. Once confirmed they are moved to the confirmed Gateway Ancestors list. Please add your ancestor's name below and link their name to their profile. To be confirmed, documentation needs to be on the profile and on each of the profiles that link them to Surety Barons. Include a section on the profile listing the names linking to the barons, (in link format to make it easy to evaluate and confirm). I have put my evidence for their ancestry on the workbook page. Elizabeth was the daughter of Matthew Herbert, who is mentioned with ancestry in Douglas Richardson's books. I have put what evidence I have for their ancestry on the Potential Gateway Ancestors page; hopefully others will eventually come along and add to it or provide contradictory evidence. If anyone knows of contradictory evidence to any current profiles in our project or potentially in our project, please add it to Popular Errors. ↑ Only his maternal ancestry is covered by Richardson. There are many more lines on his father's side. ↑ Caution: there are two John Washington profiles, not duplicates - see Virginia Magazine ref. ↑ Caution: there are two Lawrence Washington profiles, not duplicates - see Virginia Magazine ref. can a person still have distant royal origins, with no gateway ancestor Sep 5, 2016. I may have misunderstood Irene's question. I responded on her profile with information about descendant stickers. I was going to post here about the list of names posted here was based on the Gateway Ancestors listed by Ricahrdson in his Magna Carta Ancestry and Royal Ancestry and is currently pretty much static, but none of the surnames she mentions are listed. I am descended from the Davis, Stone, Towne, Nurse families listed, and my children also have the Guild family listed (Samuel and Gregory). What is the best way for me to note that - and where? I also note that singular members of the families are listed, but not siblings. What is the proof required for a sibling whose parent is listed, to become listed? Adding Gateway Ancestors to the scope of the project can be done after the trail for that person has been developed (primary sources required for relationships not documented in Richardson's works). Is there a procedure for adding a person to the list of gateway ancestors? Harlan-32, Moses Harlan, emigrated from Ireland to Pennsylvania, and was the great-great grandson of John Calvert, who is on many of the same lines as the Calverts on this list. I'm not a manager of this page, so I don't receive a notice that a comment has been posted to this page. To all who would like to have an ancestor added as a Gateway Ancestor... The subproject that worked on that is no longer active. See Category:Questionable Gateway Ancestors for details. While it is possible to have a non-Richardson profile added to the project's Gateway Ancestors, each generation from the proposed Gateway to a profile that is documented by Richardson as a descendant of a Surety Baron, you need a primary source to prove the relationship. @ Carolyn: I looked at several generations up from Parsons-882 and none had good sources (citing "Our Kingdom Come..." and an Ancestry link isn't enough - if either gave a source, you need to cite the that source, crediting the book or Ancestry). Should Parsons-882 be added to this list? It also looks like all the Magna Carta Surety Barons are related to each other and to King John. I will dig deeper, but I put a kudos for you guys on Quora. I just picked Christopher Batt randomly. And, followed three clicks back to Bigod which allowed me to remind every English person to remember William Marshal who kept us from having to speak French. Very impressive. I have answered several questions on the Magna Carta and will use WikiTree henceforth. I am directly related to all but one of the Magne Carte barons (the other is a first cousin 28 times removed). Is this common? Should (Brewster-622) Rev. Nathaniel Brewster's child(ren) (Abigail, possibly Sarah, and possibly Timothy) by his first marriage also be included here? If the profile for Abigail Reymes is correct, her g-g-g-g-grandmother was Elizabeth Boleyn, descended from Plantagenet kings and at least two Surety Barons, Henry de Bohun and Saher Quincy. Abigail's children would have been the first generation of her, possibly royal, line to immigrate as they are all presumed to have been born in England. Just for clarity, Nathaniel Brewster's second wife was Sarah Ludlow, whose father is already on this list. To S. Small: I have added James Blount to the list of "Questionable Gateway Ancestors." I don't know why he is not recognized in Douglas Richardson's books as a gateway ancestor. Perhaps Joe Cochoit would know. Right now James Blount's profile and the profiles of his alleged ancestors are woefully underdeveloped, so we can't tell if the lineage is accurate. I do notice that there was a fraudulent Blount pedigree in the past; I added a link documenting that on James Blount's profile. If I have an ancestor who is on the gateway list for the Order of Charlemagne why would he not be on this list? I am speaking of Capt. James Blount of N.C. who died in 1686. He is a descendant of Henry de Bohun. Is it typical to be related to all of them? Were they mostly related? Does anyone know about the Trowbridge family? Do they have a royal connection. Stephen Bull is another possible Gateway cousin to me. According to the wikitree relationship finder, I have some Gateway cousins, William Awbrey and his sons. Does that count? Jane (Allen) Bulkeley is descended from surety barons Robert de Roos, William Mowbray, Richard and Gilbert de Clare, and John Lacy, but her name is not in the Gateway List in Magna Carta Ancestry, because she died before her husband and children immigrated to New England. It was an error to include her as Gateway Ancestor, thank you for fixing that Liz. She is a very interesting person, and is included in Royal Ancestry as a descendant of Kings of Scotland starting with Malcolm III (Crannmore), R.A. Vol I, pp 109-111. Details have been added to her profile. I thought it was a glitch, but I ended up with all 17 of the Gateway Magna Carta barons as direct ancestors, 23rd-27th ggf. I am working on beefing up the sources on my managed profiles to remove uncertain relationships. You already see the reason: the Magna Carta barons were inter-related to a very high degree. Being descended from one doesn't always mean being descended from many others, but for most of them, that is the case. The main issue I have found is to be sure that all my links up to the Colonial immigrant are correct. 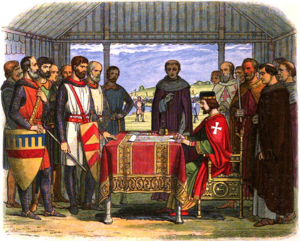 Many Colonial immigrants are included in Magna Carta Ancestry, by Douglas Richardson. Once you have determined if one of the names on his list (scroll down on this page) is your ancestor, you have a solid line of documented evidence from them to the MC baron. I have a magna carta barons question. Is it odd that I am directly related (great-grandson, grand nephew, or cousin) to ALL 17 of the Barons, or is that to be expected since they all seem to be interrelated? The line of John Hardy of Isle of Wight Co., VA has been disproven by the heralds of the College of Arms in London. They found not evidence of the so-called marriages to Stanley and De la Pole wives or that these wives were indeed descendants of Magna Charta Sureties as the parents named for these wives are not known to have had daughters by those names. Weis latest edition of The Magna Charta Sureties does not list this Hardy family. See Potential Gateway Ancestors (for information about trails for Gateway Ancestors not included in Richardson). Category: Questionable Gateway Ancestors for WikiTree profiles of people who may be Gateway Ancestors but who are not included in Richardson. Popular Errors in Colonial and Medieval Lineages for information about disproven lines. April/John - is that correct? A profile in the "Questionable Gateway Ancestor" category is any profile for a person not listed by Richardson but who is connected in WikiTree to a Magna Carta surety baron. Kind of a holding pen for any such profile. The profile is removed from the category if a false connection is found (and removed). If the connections are valid, or potentially so, the Questionable Gateway Ancestor is considered a "Potential Gateway Ancestor". I think it would be helpful to add a discussion of "Questionable Gateway Ancestors" here - eg what is it used for and how it differs (if it does) from Potential Gateway Ancestors. Thank you for all of us who have worked/are working on the project, Jillaine. We like being appreciated. Can I just say? WHOAH! This is an awesome project! Thank you April and project volunteers for what you're doing here! Updated the Culpepper group for clarity and disambiguation, with text, footnotes, and the comment box. Moved some comments on the list here to the profile. Thank you Sandy. Mainwaring-24 is sourced and edited now. Linked Oliver Mainwaring-24 as Oliver Manwaring ... profile needs better editing and work. Corrected URL for Mary (Mainwaring) Gill, if right needs banner and supporting text. Thank you Lynden for your work on the Blakiston line to their Magna Carta ancestor! It is exactly this kind of work which is most needed by our project. Hi, April! I wanted to let you know I am still working on the MCGAs George and Nehemiah Blakiston. It is a complicated line, and there is little representation on WikiTree. I guess my job will be to cover these difficult profiles. Regards. Sorry there are no Veitch entries in Richardson, Kathy. Thank you for adding links to Nelson and Lowell and correcting the states and text! Thank you for your work on the Jennings profiles, Sandy. Yes, the data on -2272 agrees with Richardson. He did settle at Ripon Hall, York county, Virginia. He was buried in Bruton Parish, Williamsburg, Virginia. His second wife, Sarah (last name unknown) died 27 March 1728 and she was buried with her husband. I linked Jennings-2272 for Edmund Jennings, which has proposed merges to get to the LNAB. Can you double check me re Richardson? Thank you P Eyestone! I appreciate your tip on Wyatt, and have added her, and found a few others on the list I'd missed which I'm adding. I'll send your badge as soon as your name is added to the member list. Welcome to Magna Carta Project! Great to find this project here! Can I join? One that I think you may be missing is Wyatt-300. Margaret Wyatt. A good proof for her: Richardson, Douglas, and Kimball G. Everingham. Royal Ancestry: A Study in Colonial and Medieval Families. Vol. 1. Salt Lake City, UT. : Douglas Richardson., 2013, pp. 114, 115. Hi, April! I just wanted to let you know that my order of Royal Ancestry arrived. Lynden. Thank you Sandy. I added the source and footnotes. I activated a link to Elizabeth (St John) Whiting a profile that I know needs improvement. I've received the Magna Carta Ancestry by Richardson, and the answer is in Vol IV, page 207. Smith-1217 is the son of Christopher Smith, Gent., of Stanihurst and his wife Elizabeth Towneley, who married him as her second husband after Richard Halstead. Lawrence Smith married Mary Debnam [Roberts Royal Descents of 600 Immigrants (2004; 416-421], [Virginia Magazine of History and Biography 81; 1973, 319-367]. Data for Lawrence Smith is much more limited than for most entries - there is nothing more except his relatives listed below. So it would seem he is the same person, only Richardson disagrees on who is his wife. Please let me know if the wife gets changed on this profile - I would like to be able to add it to category:gateway ancestors. Lawrence Smith is not listed with siblings in Richardson's books however he is listed with two Towneley cousins who immigrated to Virginia: Lawrence Towneley son of Lawrence Towneley; Edward Hoyle son of Anne Towneley - Edward married Ann Debnam (sister or cousin of Lawrence Smith's wife Mary??). Thank you for bringing it to my notice - these colonial ancestors are sometimes difficult to sort out one from another. great work! thanks for doing this, it will be a very helpful reference for others! If so, he had siblings that came to America also.